1.4 Hawaii Votes - Yes or No to G.M.O.s? 5.3 Elephant Contraception- Possible Solution for South Africa’s “Elephant Problem”? Herbicides were sprayed by military forces of the United States during the Vietnam War (1961-1971). A debate has been waged since the early 70’s as to whether the use herbicides are associated with diabetes, cancer, birth defects, and other serious ailments. While this association has been denied, the effects of herbicide use in Vietnam linger. Figure 1. A U.S. Military helicopter spraying Agent Orange in Vietnam. Courtesy of the U.S. Army. Public Domain. The Vietnam War began in 1961 and lasted until April of 1975. Between 1961 and 1971, mixtures of herbicides were utilized by the U.S. military against the Republic of Vietnam forces1 (Figure 1). 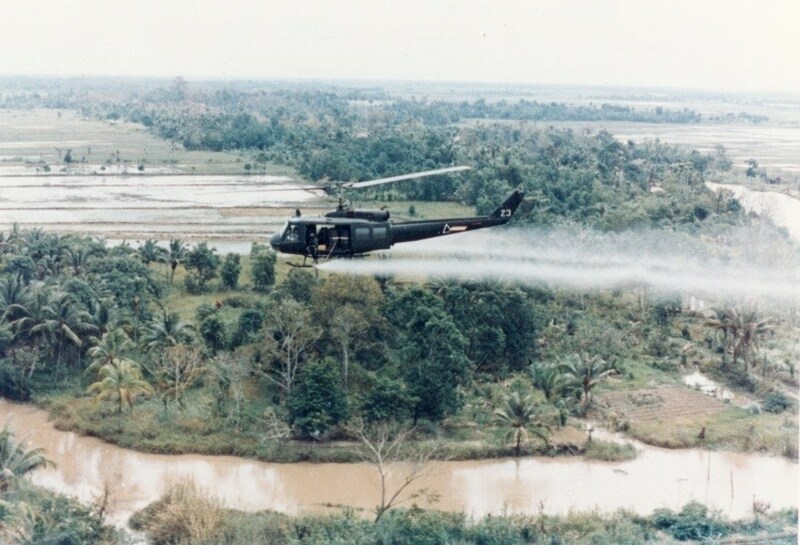 The most infamous of these herbicides, Agent Orange, was used to deprive Vietnamese forces of crops to eat and forest canopy in which to hide.2 An estimated 49.3 million liters were sprayed over 2.6 million acres during the war.3 Within days of application, plant and animal life for kilometers were completely devastated. Agent Orange has had adverse effects on Vietnam’s foliage and animal life. However, the debate continues as to whether humans that were exposed are at higher risks for certain ailments. Dioxins are an extremely prevalent and dangerous environmental pollutant.4 They are typically manufactured as products of industrial processes and incinerations.4 Agent Orange is composed of 2,4-dichloro-phenoxyacetic acid, 2,4,5-trichlorophenoxyacetic acid and contains traces of 2,3,7,8-tetrachlorodibenzo-p-dioxin (TCDD)5 (Figure 2). Some reports have shown that approximately 3 parts per million of TCDD can be found in Agent Orange.6 This poses a concern for people that were exposed to Agent Orange because dioxins may accumulate in fatty tissue.4 After accumulating, dioxins can disrupt the endocrine system by forming unusual enzyme complexes that act as an intermediary in the breakdown of steroid-hormone receptors.4 Numerous studies have been conducted since the late 1960s to connect dioxin-contaminated Agent Orange to multiple illnesses such as diabetes, birth defects, and cancers.5 While some researchers argue that “environmental dissipation, low bioavailability, the protection of overhead canopy, the properties of the herbicides, and the circumstances of application” would lead to a low chance of exposure for troops, others found statistical associations between the herbicide and the aforementioned ailments.7 Surprisingly, a fair portion of these studies have rendered inconclusive results when considering human impairments. Figure 2a. 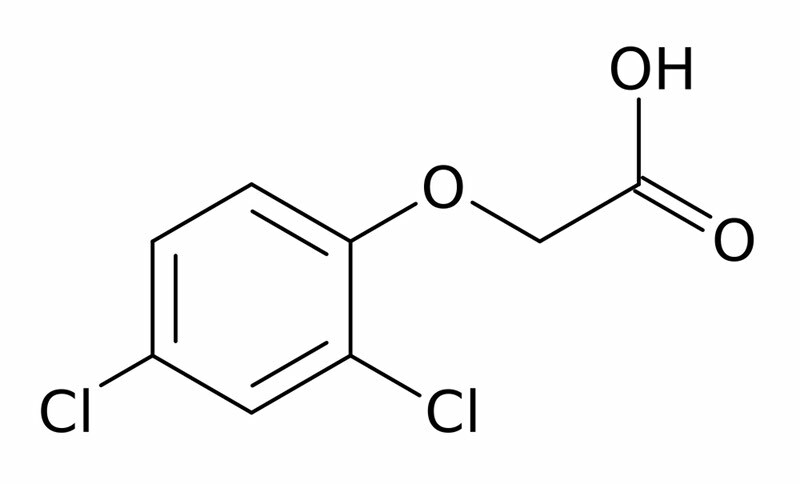 Molecular structure of 2,4-dichloro-phenoxyacetic acid. Figure 2b. 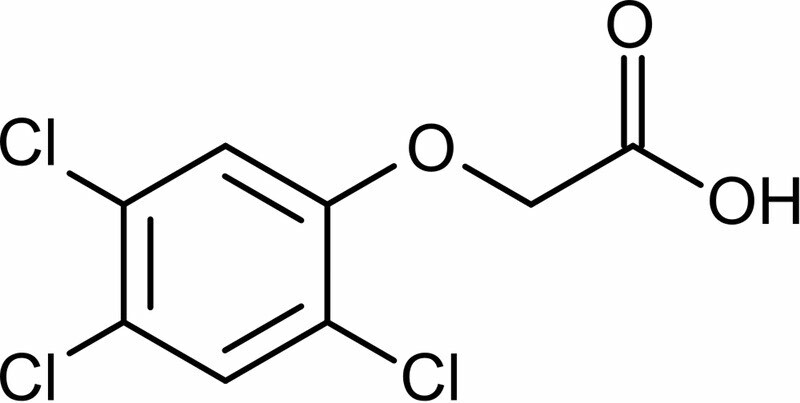 Molecular structure of 2,4,5-trichlorophenoxyacetic acid. Figure 2c. Molecular structure of 2,3,7,8-tetrachlorodibenzo-p-dioxin (TCDD) or Dioxin. In the late 1960s, evidence linking dioxins to birth defects in mice and reports of birth defects in Vietnam began to arise.2 On October 31 of 1971, the U.S. ceased tactical herbicide missions in Vietnam.7 One year prior to this cessation, Congress had urged the Department of Defense to work in unison with the National Academy of Sciences to conduct a study on possible effects of Agent Orange exposure.3 This study found an association between dioxin and birth defects, but the link was deemed statistically insignificant.3 These results did not suppress interest in Agent Orange. Between 1979 and 1990, federal departments and agencies in the U.S. helped sponsor over 50 studies focused on the herbicide7 (Figure 3). Although all of these research programs failed at yielding a definitive assessment, many found modest associations between illnesses and Agent Orange. Figure 3. 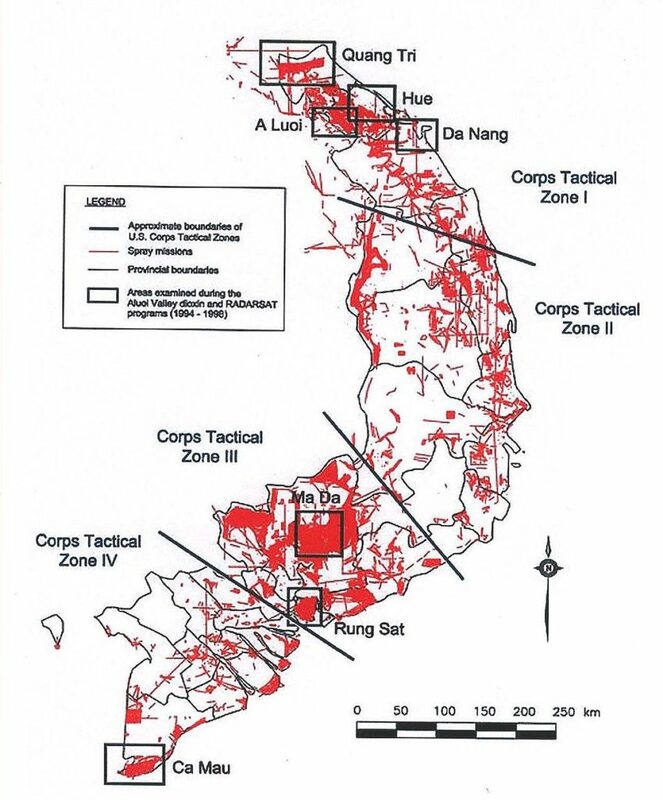 Aerial herbicide spray missions in southern Vietnam between 1965 and 1971. Courtesy of the U.S. Army, 2011. Public Domain. In 1991, Congress passed legislation that directed the Secretary of the Department of Veterans Affairs to work with the National Academy of Sciences, Institute of Medicine, to research Agent Orange.7 Researchers at the Institute of Medicine found statistical associations between dioxin exposure and type 2 diabetes, many types of leukemia, Hodgkin’s disease, non-Hodgkin’s lymphoma, prostate and respiratory cancers, heart disease, Parkinson’s disease, and birth defects among other ailments.7 A noteworthy study conducted in 2006 combined data from 22 other studies to conclude Agent Orange exposure is linked to increased risks of birth defects3 (Figure 4). Two researchers from Texas also found a correlation among dioxins, diabetes, and cancer in Ranch Hand veterans after they adjusted for calendar period, days of spraying, and time spent in Asia.5 These studies demonstrate the many harmful effects of Agent Orange. However, there remains a degree of uncertainty concerning the herbicide that has had policy implications and environmental impacts. Figure 4. A Vietnamese mother holds her son who has been physically and mentally handicapped since birth due to her exposure to Agent Orange. Photograph by Alexis Duclos, 2004. CC BY-SA 3.0. Yet, the U.S. government has been slow to funnel aid to the Vietnamese. During President George W. Bush’s second term, Congress began distributing several million dollars to fund a cleanup project in Da Nang, Vietnam, which is expected to be completed by 2016.8,9 Da Nang has exceedingly high levels of dioxin, shrubs and weeds still cannot grow there.6 Aside from this cleanup, the U.S. government has refused to acknowledge their responsibility for the health effects Agent Orange has had on the Vietnamese. Benefits enjoyed by U.S. veterans have yet to be extended to civilians living in the dioxin saturated areas of Vietnam.9 Many U.S. veterans, irritated with government inaction have moved to Vietnam to help cleanup efforts.10 One veteran quipped, “We get more support from the government of Norway” in a recent interview.10 Some find hope for U.S. reparation to Vietnam in the rise of China as an international global competitor. The U.S. and Vietnam have a mutual interest in balancing Chinese hegemony.10 President Obama has hinted at shifting from wars in Iraq and Afghanistan to Asia, in order to profit from the region’s rising economic prosperity while maintaining a watch on China’s military forces.8 This foreign policy adjustment has the potential to improve U.S.-Vietnamese relations. The former Secretary General of the United Nations, Kofi Annan, was quoted saying, “As long as wars have existed, the environment and natural resources have been their silent victims”.11 In the same address, Annan expressed contempt for delayed responses by many to curb the harsh effects of prolonged wars on the environment, citing the United States and its use of Agent Orange.11 The U.S. government maintains an inconsistent position on the issue of Agent Orange. Through allocation of resources to Da Nang, and the coverage of health care costs of U.S. veterans, the U.S. government has acknowledged the adverse environmental and health effects of Agent Orange. Despite these efforts, little monetary support is given to Vietnamese veterans and areas outside Da Nang. Research suggests Agent Orange has affected not only the physical and biological environment of the 60s and 70s, but also subsequent generations of Vietnam War veterans, the civilian population, and the current environment. Forty years of research has suggested that the environment may not be the only silent victim of the Vietnam War. The U.S. government should disperse more humanitarian aid to Vietnam to alleviate the detrimental effects of Agent Orange and to improve its international reputation. History demonstrates trust amongst nations emerges from successful, cooperative engagements that overcome disagreements. Funding a large-scale cleanup project would serve as a tremendous step in the right direction for the health of the Vietnamese people and the diminishing reputation of the United States as a global leader in humanitarian efforts. Ngo, A.D., et al. (2006). Association between Agent Orange and Birth Defects: Systematic Review and Meta-Analysis. International Journal of Epidemiology 35.5: 220-30. Harper, J.W. (2007). Chemical Biology: A Degrading Solution to Pollution. Nature 446:499-500. Stone, R. (2007). Chemical Clearance. Science. Young, A. (2011). Agent Orange Exposure and Attributed Health Effects in Vietnam Veterans. Military Medicine 176:29-34. Coll, Steve. (12 April 2012). America’s Debt to Vietnam. The New Yorker. Annan, Kofi. (11 Jan 2004). No Conflict Is Too Remote to Affect Local Environment, Secretary – General Says in Message to Mark International Day to Prevent Exploitation. United Nations. U.S. Army. (Undated). [Photograph of a U.S. Huey helicopter spraying Agent Orange over Vietnam]. Retrieved from Wikimedia Commons. Public Domain. [Molecular diagram of Agent Orange compounds]. Retrieved from Wikimedia Commons. Public Domain. U.S. Department of the Army. (2011). [Map showing locations of U.S. Army aerial herbicide spray missions in south Vietnam from 1965 to 1971]. Retrieved from Wikimedia Commons. Public Domain. Duclos, Alexis. (2004). [Photograph of two Vietnamese pose in front of a billboard]. Retrieved from Wikimedia Commons.CC BY-SA 3.0. Environmental ScienceBites by Kylienne A. Clark, Travis R. Shaul, and Brian H. Lower is licensed under a Creative Commons Attribution-NonCommercial 4.0 International License, except where otherwise noted.